Thomas Mann is widely recognized as one of the greatest German novelists of the twentieth century. Exile from his homeland created the opportunity for him to become a major transatlantic figure as well. The intellectual and civic leadership he offered, especially his public opposition to the worldwide threat of fascism, allowed him to exercise cultural and political influence on both sides of the Atlantic until his death in 1955. Particularly important in this regard were his criticisms of Hitler and the National Socialists in Germany, his leadership of European anti-fascists in exile, his influence on American policymakers during World War II, and his contributions to the debate about German responsibility for the war. A Bildungsbürger from the Hanseatic city of Lübeck, Mann possessed the traditional attitudes of that class, including an aversion to “politics.” He believed it was his responsibility to promote and protect culture, to educate and guide the educated middle classes. Mann thus never aspired to or held political office, though he gradually became more embroiled in public, and often explicitly political, debates. By the time World War I began, he had come to understand that as a cultural leader in the mold of Goethe—a Dichter—a certain amount of intellectual and civic leadership was expected of him as well. Mann’s first statements as a public intellectual came during World War I, when he took a conventionally patriotic and conservative line by defending the war, the German cultural tradition, and even the monarchy. His full-length statement on the war, Reflections of an Unpolitical Man (Betrachtungen eines Unpolitischen), was an extended essay about the conflict of “culture” and “civilization,” Germany and the Atlantic West; in it, Mann derided party politics and democracy which, he argued, brought chaos, destroyed traditional values, and threatened the “complete leveling” and “vulgarization” of culture. He defended monarchy “because it alone guarantees political freedom, both in the intellectual and economic spheres” (Mann 1983, 78, 187-88, 201, 189). With Reflections, Mann won many supporters among the conservatives and nationalists in Germany, but these same supporters quickly became his bitter opponents between 1919 and 1925 when Mann moved to support the Weimar Republic and the Social Democrats. By 1925, he had come to believe that culture needed a democratic political framework for protection because the Bismarckian compromise between the middle classes and the aristocracy had failed. Democracy was thus the political form most suitable for the contemporary German nation and for the future of humanity. During the Weimar years, Mann became one of the leading intellectual voices for liberal democracy in Germany. He felt compelled to give his support to the Republic and, more particularly, to win over the educated German middle classes who made up the core of his audience. In order to do so, he defended democracy and confronted various right-wing elements, including the National Socialists, in public lectures, interviews, and essays. In his most important post-Reflections statement during the interwar period, “German Address: An Appeal to Reason” (1930), he attacked National Socialism as antithetical to everything that was innately German. It was hatred “not of the foreigner but of all Germans who do not believe in its methods, and whom it promise[s] to destroy” (Mann 1994, 150-159). Mann’s former conservative supporters saw his reversal as political and intellectual treason, and they never forgave him for it. Yet Mann’s decisive break with Germany did not come until 1933, after his speech “Leiden und Grösse Richard Wagners.” In it, he pointed to Wagner’s unparalleled greatness as a synthesizer of musical styles and genres, but his criticisms of Wagner resulted in a signed letter of protest from the cultural establishment in Munich. This “betrayal,” as he called it, was the beginning of Mann’s “national excommunication” (Mann 1933, 1). In 1933, Mann left Germany for a European lecture tour and, although he could not have known it at the time, would never again live in his homeland. Initially, he was uncertain of how to continue his critical opposition, and only later, in 1936, did he publicly attack the Nazi regime in an open letter as being “directed against Europe and against loftier Germanism; [and] against the Christian and classical foundations of Western morality. It is the attempt to shake off the ties of civilization…[and] threatens to bring about a terrible alienation… between the land of Goethe and the rest of the world.” Convinced that nothing good could possibly come of the present German regime, he shunned the country in whose cultural traditions he was so deeply rooted (Mann 1970, 209). He lived first in Switzerland and then, from 1939 until 1952, in the United States. His final three years were spent near Zurich, Switzerland. Thomas Mann became a symbol for the “other Germany” and a prominent voice in the exile community. His public attack on the Nazi regime cost him his German citizenship, but his open letter turned out to be an important step for him and other exiles. It reaffirmed the decision made by many to fight Hitler and the Nazis from abroad. Moreover, it established Mann as the most recognizable figure among German émigrés in the United States. Working first from Princeton, New Jersey and then from Pacific Palisades, California, Mann maintained contact with many German and European friends, including Bruno Frank, Alfred Neumann, and Bruno Walter—all long-time companions from Munich—as well as with Franz Werfel, Wilhelm Dieterle, and Lion Feuchtwanger—the last of whom served as a reliable go-between connecting Mann with left-wing colleagues such as Theodor Adorno, Max Horkheimer, and Bertolt Brecht. Among the non-German European friends with whom Mann kept in touch during his exile were the musicians Igor Stravinsky and Arturo Toscanini (Frey 1976, 85). This collection of friends was very influential in anti-fascist circles in the United States during the war years, and many would regain their importance again in Europe after 1945. Mann also exercised considerable influence among Americans. Not long after his 1938 arrival in the United States, he was hailed “the world’s greatest novelist,” received an honorary degree from Harvard, and dined with President Roosevelt at the White House. Understanding the significance of his position, Mann agreed to serve on countless committees and became a constant presence on the American lecture circuit. His position brought him into contact with U.S. State Department officials such as Adolf Berle and the Attorney General Francis Biddle. A vocal opponent of appeasement and isolationism, Mann argued that outside force—American force—would be required to defeat world fascism. As he began to distance himself emotionally and politically from Germany, he slowly—but incompletely—integrated himself into American society. More than once in the early 1940s, he noted how difficult it was to be a German exile when the very name of Germany was synonymous with horror and fear. He was determined not to return to Germany, but, rather, to become an American citizen. Yet his closest friends remained German cultural elites. In addition to anti-fascist committee activities and speeches, including his famous BBC broadcasts urging German listeners to throw off the Nazi yoke, Mann served as a spokesman and advocated for many European anti-fascist refugees in the United States. His plea before the Tolan Committee on Internal Migration in March 1942 was one prime example. In a telegram to Roosevelt, he joined such luminaries as Albert Einstein, Arturo Toscanini, and Bruno Walter in defending the loyalty of pro-America émigrés from Germany and Italy. He pointed out that many had been “among the earliest and most farsighted adversaries of the governments against whom the United States are now at war.” They had lost their property and had risked their lives fighting against fascism, even when many world governments had hesitated to act (Mann 1963, 236-237). Along with the telegram, the committee forwarded its proposals directly to Washington, and, in the ensuing weeks, the American government and the public took an increasingly sympathetic position. Mann and his associates surely contributed substantially to preventing the large-scale evacuation of Germans and Italians living in California to those camps established in the wake of Executive Order No. 9066 that were used primarily for the internment of Japanese immigrants and Japanese Americans (U.S. Department of the Interior 1946, viii). Many within the “Free Germany Movement” wanted Mann to use his influence with U.S. government officials to gain support for their efforts to establish a government in exile and plan for the democratic reconstruction of Germany. Though a seemingly natural leader for the group, Mann instead distanced himself, refusing to associate too closely with communists such as Bertolt Brecht or to endanger his candidacy for American citizenship. Mann believed it was neither his responsibility nor his right as an exile to give America advice on its approach to Germany. Thus he first signed, and then withdrew his endorsement of, an August 1943 manifesto written by, among others, Feuchtwanger, Brecht, Herbert Marcuse, and Mann’s brother Heinrich. The manifesto insisted that a clear distinction be made between Nazis and the German people, but Mann believed it was impossible in many cases to distinguish between the Germans and their Nazi leaders. Indeed, Germans of all classes had become deeply complicit with Nazism. Mann further developed this theme in two seminal works on Germany and Nazism: “Germany and the Germans” and Doctor Faustus. Mann also criticized more specific aspects of the German tradition, including nationalism, anti-Semitism, and authoritarianism. He was particularly critical of the German conception of liberty for being “always directed outward; it meant the right to be German, only German and nothing beyond that.” Both racial and anti-European, the German understanding of liberty was tantamount to the inner enslavement of the German people because Germany had never experienced a revolution and had “never learned to combine the concept of the nation with the concept of liberty” (Mann 1973, 39). Mann gave a number of speeches and public interviews during the mid-1940s in which he returned again and again to the theme of collective German responsibility for Nazism and its crimes against humanity. He did not believe that a politically autonomous Germany could or should be restored. If Germany had anything to offer the future, it would need to come through culture—but culture embedded in the Western, humanist tradition. These views were popular neither in Germany nor—at least among the German exiles—in the United States. Yet Mann remained an important and influential voice in the postwar period. Many in Germany pleaded with him to return “like a good physician” and help heal his homeland. Despite repeated requests from the so-called “inner emigrants”—those who had remained in Germany and, in one way or another, made their peace with the Nazi regime—Mann refused to return to Germany, which he no longer considered his home. He was German by birth, but now an American citizen by choice. Coupled with his sharp public indictment of Germany, this refusal invited further recriminations, especially from the “inner emigrants.” The troubled relationship between Mann and his homeland persisted until his death in 1955. Yet his statements about the origins and deep roots of Nazism and world fascism, German and European culture, and responsibility for World War II remain a touchstone of debate both in Germany and the United States. Mann had planned to remain in California for the remainder of his life, but, fearing that McCarthyism might lead to a new form of fascism and under personal attack from some members of Congress for his political positions, he immigrated to Zurich, Switzerland in 1952. He saw in the hysterical anti-communism of postwar America the same intellectual intolerance, political persecution, and declining legal security that he had experienced in Germany at the end of the Weimar Republic. Officially an American citizen, Mann had in any case come to see himself as a European “world citizen.” He could hardly deny his German roots, and America had offered him protection from Nazism and the war as well as a broader view of the world, but he increasingly identified himself as a cosmopolitan European during the last decade of his life. He returned to Germany occasionally in the postwar period, first in 1949 for a lecture tour and a final time in 1955 when he gave his now-famous Schiller Address in his home city of Lübeck. In this speech, he tried again to resume the role of a cultural leader, a Dichter, for Germany—an effort that was not entirely rejected by Germans. Yet Mann had become, in many respects, a permanent exile who spoke from a much broader, transatlantic perspective. Mann, Thomas. "An Appeal to Reason." In The Weimar Republic Sourcebook. Edited by Anton Kaes, Martin Jay, and Edward Dimendberg, 150–159. Berkeley: University of California Press, 1994. Mann, Thomas. Briefe 1937–1947. Edited by Erika Mann. Frankfurt am Main: S. Fischer, 1963. Mann, Thomas. Doctor Faustus: The Life of the German Composer Adrian Leverkühn as told by a Friend. Translated by John E. Woods. New York: Vintage, 1997. Mann, Thomas. "Germany and the Germans." In Literary Lectures Presented at the Library of Congress. Washington, DC: Library of Congress, 1973. Mann, Thomas. Letters of Thomas Mann, 1889-1955. Translated by Richard and Clara Winston. Berkeley: University of California Press, 1970. Mann, Thomas. Reflections of a Nonpolitical Man. Translated by Walter D. Morris. New York: Fredrick Ungar Publishing Co., 1983. Mann, Thomas. "Thomas Mann verteidigt sich: Miβverständnisse um Richard Wagner." Deutsche Allgemeine Zeitung, April 22, 1933. Frey, Erich. 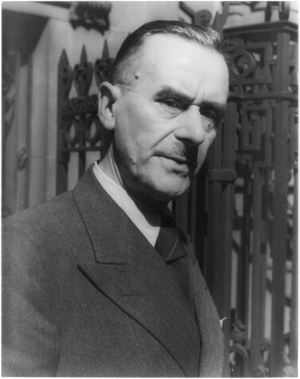 "Thomas Mann’s Exile Years in America." Modern Language Studies 6, no. 1 (1976): 79–85. Heilbutt, Anthony. Exiled In Paradise: German Refugee Artists and Intellectuals in America from the 1930s to the Present. Boston: Beacon Press, 1983. Hollywood Writers’ Mobilization. Writers’ Congress: The Proceedings of the Conference Held in October 1943 under the Sponsorship of the Hollywood Writers’ Mobilization and the University of California. Berkeley: University of California Press, 1944. Koopmann, Helmut. "‘German Culture is Where I Am’: Thomas Mann in Exile." Studies in Twentieth Century Literature 7, no. 1 (1982): 5–20. Kurzke, Hermann. Thomas Mann: Das Leben als Kunstwerk. Eine Biographie. Munich: C.H. Beck, 1999. Prater, Donald. Thomas Mann: A Life. New York: Oxford University Press, 1995. U.S. Department of the Interior. WRA: A Story of Human Conservation. Washington, DC: U.S. Government Printing Office, 1946. Vaget, Hans Rudolf. "Vorzeitiger Antifaschismus und andere unamerikanische Umtriebe. Aus den geheimen Akten des FBI über Thomas Mann." In Horizonte: Festschrift für Herbert Lehnert, edited by Hannelore Mundt, Egon Schwartz & William J. Lillyman, 173–204. Tübingen: M. Niemeyer, 1990. Thomas-Mann-Archiv der ETH Zürich, Switzerland.